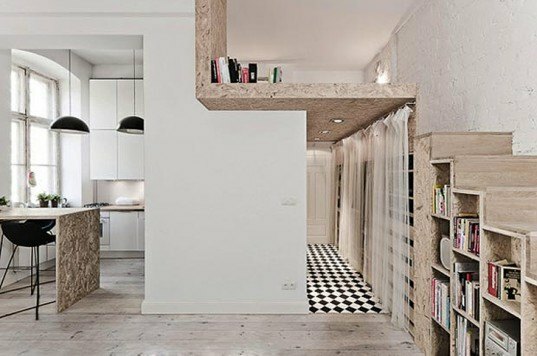 At just 312 square feet, this tiny apartment in Poland presented a challenge to its owners, who wanted to fit in all the comforts of home without feeling cramped. The renovation by 3XA Architects gave the home a mezzanine sleeping level that not only maximizes space, but also includes a minimal staircase that doubles as storage shelves. The partial second level added valuable space, making the tiny home complete with separate sleeping, living and dining areas. Before 3XA’s renovation, the efficiency apartment was just a single room, with no partitions for designated living areas. Inspired by—and wanting to make use of—the lofty 12 foot ceilings, the architects’ first impulse was to insert a second level, which would divide the apartment and utilize the unused vertical space. Using plywood as both a sustainable and decorative material, the designers built a row of gradating shelves capped with stairs that lead to the sleeping loft, which also acts like a plywood insertion in the space. Underneath the sleeping loft, 3XA created a corridor that leads to the apartment’s entrance and bathroom. Black and white floor tiles make it feel like a distinctly separate space, which is lined with shelving. The underside of the sleeping loft is inlaid with spotlights that illuminate the space. On the other side of the corridor is the divided kitchen and dining area. The dining table echoes the sleeping loft, with a plywood side tying the aesthetic together. The living room faces the dining and sleeping loft, and feels open and airy with floor to ceiling windows. 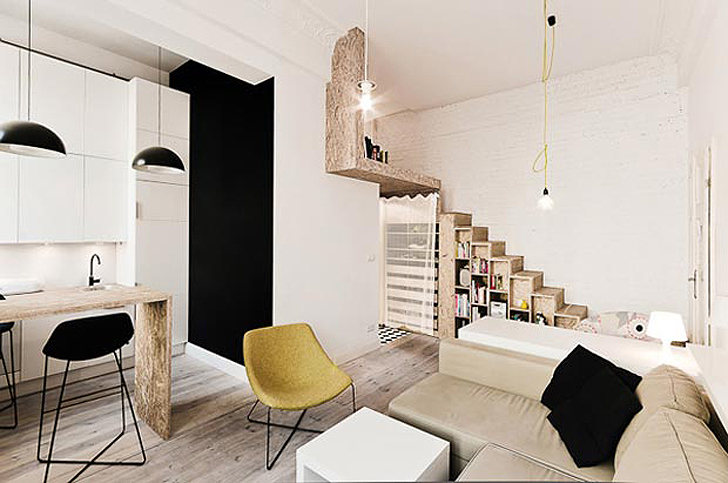 By adding a second level in part of the apartment, 3XA made a modest efficiency apartment feel like a complete home. Before 3XA’s renovation, the efficiency apartment was just a single room, without partitioning for designated living areas. Inspired by and wanting to make use of the lofty 12 foot ceilings, the architects’ first impulse was to insert a second level, which would divide the apartment and make use of the unused vertical space. Using plywood as both a sustainable and decorative material, the designers built a row of gradating shelves capped with stairs that lead to the sleeping loft, which also acts like a plywood insertion in the space. Underneath the sleeping loft, 3XA created a corridor that leads to the apartment’s entrance and bathroom. Black and white floor tiles make it feel like a distinctly separate space, which is lined with shelving. The underside of the sleeping loft is inlaid with spotlights that illuminate the space. The otherside of the corridor is the divided kitchen and dining area. The dining table echoes the sleeping loft, with a plywood side tying the aesthetic together. The living room faces the dining and sleeping loft, and feels open and airy with floor to ceiling windows.